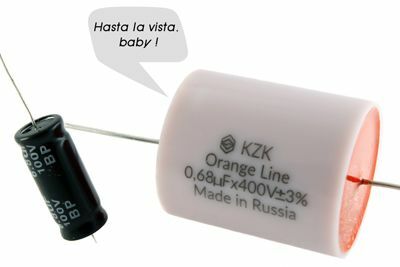 KZK Orange Line - special edition of polypropylene film audio capacitors KZK K78-34 with foil aluminium plates(FKP). The maximal capacitance is 1uF due to the technological limitations at the production site. The foil makes it possible to achieve more open and rich sound, and the design features improve the detail of the sound in the high-frequency bandwidth. During testing capacitors there was an increase in the volume of the sound stage and the saturation of the sound. 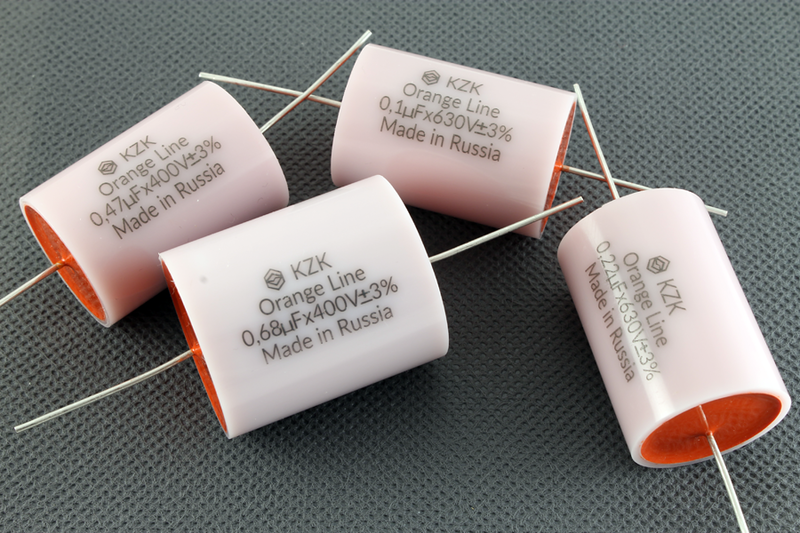 Parallel connection of several capacitors of small capacity instead of one large capacitor is used in the foil capacitors of the Orange Line KZK series from Kuznetsky Zavod Kondensatorov. The smaller the distance between the ends of the capacitor, that is, the smaller the length of its lining, the smaller the parasitic inductance of the capacitor which negatively affects its frequency properties. By connecting a plurality of capacitors in parallel, it is possible to obtain a capacitor network theoretically of any capacity without impairment the frequency characteristics of the resultant capacitor. 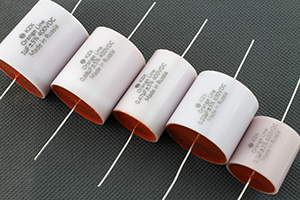 Some brands are trying to achieve the same effect, for example, using the so-called reverse geometry, when the length of the capacitor is comparable or even smaller than its diameter. This Mundorf Mcap Evo or MIT MultiCap model has the following features: they have the capacitors parallel at the stage of reeling with a special reeling machine. In non-polarized KZK Orange Line Audiophile capacitors a high-quality dielectric - polypropylene is used, which has undergone strict input control at production site. TO PURCHASE KZK ORANGE LINE, PLEASE CONTACT US DIRECTLY FOR QUOTATION OR VISIT OUR EBAY STORE. WE SPEAK ENGLISH AND RUSSIAN. If you have any questions or enquires, please do not hesitate to contact me. Foil/PP Film HiFi Capacitors for Sale! 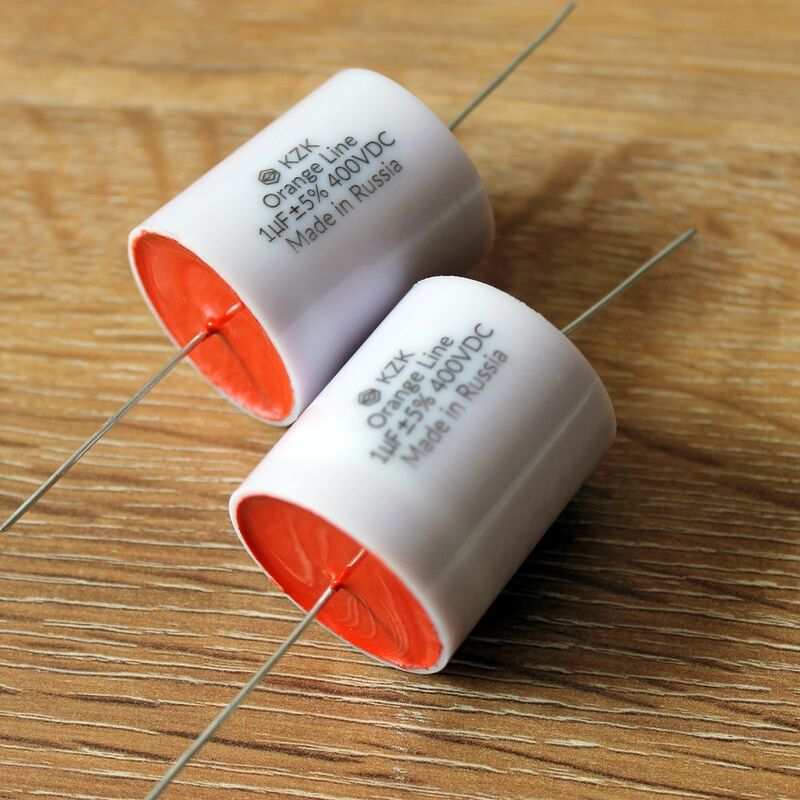 I received the 0.22uf Orange Line capacitors yesterday. I soldered them onto my tube amp and the impact on the sound is quite noticeable. The capacitors added richness and warmth to the high and mid but the trade-off to the resolution is almost unnoticeable. The overall sound remains clear and open. All in all Orange Line is a very nice and affordable capacitor for audiophile use. After trying Black Line and Orange Line I am almost a fan of KZK capacitors. I would come back to you once I am in need of cap upgrade. Please write your enquiry here and press the yellow button below. We will answer you during 3 business hours. Thank you.